A Caribs player makes a darting run against Harvard yesterday at the Queen's Park Savannah. 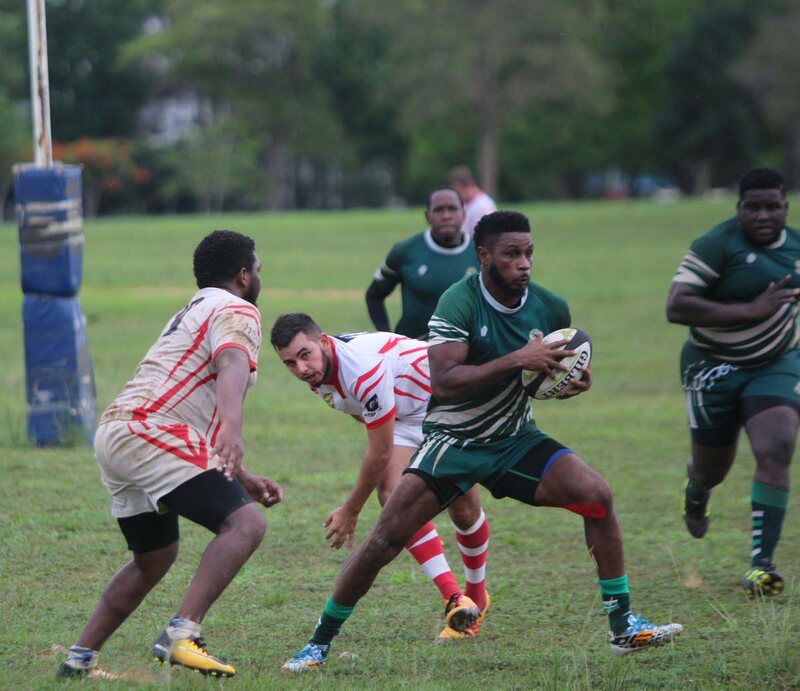 IN a fiery yet fitting start to the TT Rugby Football Union (TTRFU) Championship season, Harvard reclaimed the Robert Farfan trophy yesterday when they defeated Caribs 17-15 at the Queen's Park Savannah, Port-of-Spain. 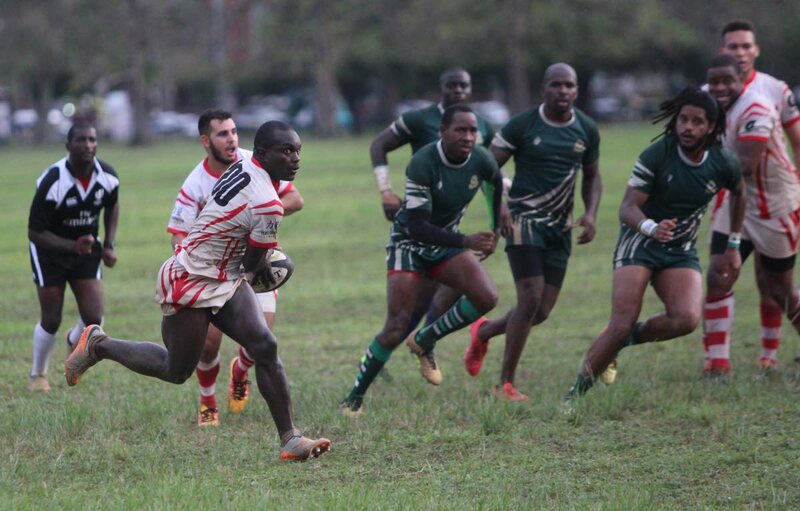 The win sees Harvard go joint top in the Championship, along with Trinidad Northern. At President's Ground, St Ann's, in the earlier fixture, Northern defeated Royalians 24-17. The day's feature match for the Robert Farfan trophy – which doubles as a league fixture – between Harvard and Caribs left coaches from both teams fuming and with barely a voice at the final whistle given the number of unforced errors in their respective attacks. Harvard, however, enjoyed a strong start and should have had an early advantage from a penalty, but Aasan Lewis' effort was scuffed and far from the upright. Caribs also had an opportunity to take an early lead via a penalty from Fiji-born TT player, Bess Waka, that also missed the target. The match then took a sharp turn around the 20th minute when a scuffle broke out which would eventually see Darren Clancy – a player born in Ireland and also on the TT national team – booked by referee Ryan Hinckson for throwing a punch. All the while, play continued, and with half the players from either team focused on the off-the-ball incident, Joseph Quashie paced half the length of the pitch practically uncontested to give Harvard a 5-0 advantage. Lewis, the designated dead ball kicker, missed the conversion attempt. Caribs then pulled three points back with a penalty converted by Sean Caesar in the last scoring action of the first half. With a 5-3 lead, Harvard entered the second half similarly commanding, and went up 12-3 almost immediately when Lewis scored a try and conversion. Caribs enjoyed more meaningful possession in the second half and were seemingly on course to mount a come-back when Samuel Roberts scored a try, converted by Waka, only for Harvard to extend their lead to 17-10 with minutes left in the contest. Opportunities were few and far between from both sides, which meant the numerous knock-ons left players, coaches and supporters groaning on the sidelines. In the dying moments, Caribs pulled another try back via Waka, who missed the conversion effort that surely would have seen the two teams share the points. In the end, Caribs only consolation would be the one bonus point that comes from losing by under seven points. Following the match, Harvard coach Jerry Legall said he was happy his team secured the win, but was unimpressed by the manner in which it was done. "I'm pleased with the result, but not in the way we played. I think we made too many mistakes in areas that we are going to have to work on in training," Legall said. He identified Harvard's decision-making as their primary weakness during the match and admitted his team was lucky Caribs also made many errors. The Robert Farfan trophy is held annually in remembrance of former Trinidad Northern Player Robert Farfan. Reply to "Harvard edge Caribs for Robert Farfan trophy"